With more days, more events and MORE CANDY added to this years Brick or Treat event at LEGOLAND it’s the best time to visit LEGOLAND Florida! Brick or Treat is a friendly, non frightening event which features trick-or-treating, seasonal Halloween shows, giant LEGO models, special meet-and greets with LEGO Halloween characters and more! The dates it is running are: October 6th, 7th, 13th, 14th, 20th, 21st, 27th, 28th and 31st. Monster Bash dance party, sweet treats, festive shopping and more! Don’t forget this event is included with your LEGOLAND admission tickets so what’s your excuse??? 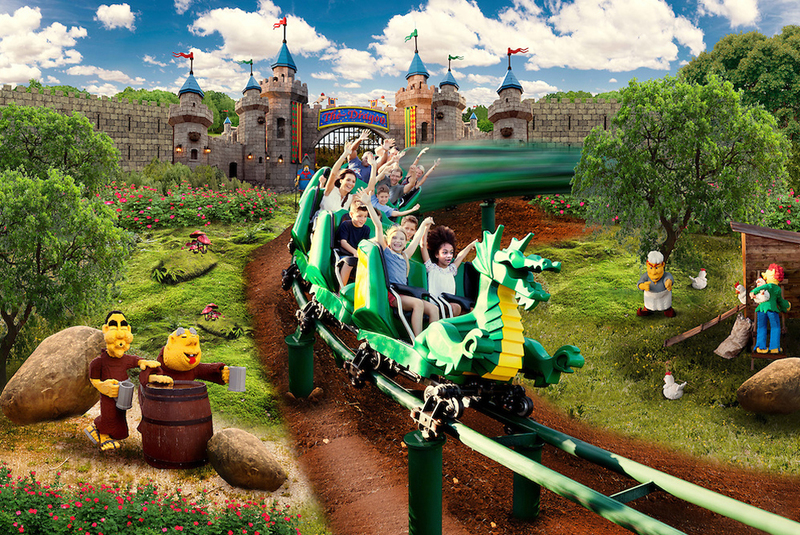 The highly anticipated new VR attraction at LEGOLAND Florida now has an opening date! On the 23rd March 2018 you will be able to experience the thrills of a coaster with virtual reality technology as you race against all your favourite minifigures. The ‘wild and wacky’ race pits guests against a pirate, wizard, surfer and pharaoh as they steer LEGO-built vehicles like a rocket-powered windsurfing rig, a stylish scooter fuelled by espresso and an ornately canopied bed (called a “litter”) carried by mummy servants. Also check out all the other awesomeness coming to LEGOLAND in 2018. It looks as though there is a big year ahead of us at LEGOLAND Florida as they have just announced what we can expect within the next 12 months.. Take a look! Celebrate your favourite ninja heroes with exclusive in-park activities and meet-and-greets with Kai, Nya and for the first time ever – Master Wu! The Great LEGO Race: Opening March 23rd! Visit LEGOLAND as they unveil the newest addition to our LEGO® Star Wars™ MINILAND Model Display. Created with thousands of LEGO bricks, the display features memorable moments from Episode VII of the popular Star Wars™ saga enhanced with lights, sound effects and animation. Enjoy the huge new LEGO® Star Wars™ display in MINILAND USA as you celebrate a record three weekends of fun from “a galaxy, far, far away”! Activities include meet-and-greets with LEGO Darth Vader and – new! – a LEGO character from “The Force Awakens” and “The Last Jedi,” hands-on LEGO® Star Wars™ building activities and much more. Celebrate America’s independence on Wednesday, July 4 as we light the skies above Lake Eloise with one of our biggest fireworks shows of the year! Before the sun goes down, help create a giant U.S. flag out of thousands of LEGO bricks. The very popular Halloween event returns full of spooky, kooky LEGO fun for kids. The friendly-not-frightening event features trick-or-treating inside the theme park, giant LEGO models and photo ops, LEGO build activities, meet-and-greets with LEGO Halloween characters and an exclusive, themed fireworks spectacular in Pirates’ Cove. The annual holiday celebration returns to deck the halls with a 30-foot-tall LEGO Christmas tree lit several times each evening in a brilliant combination of twinkling lights and classic yuletide music, festive decorations and photo ops, including a giant LEGO wreath and a life-size LEGO Santa, reindeer and sleigh, plus holiday-themed scavenger hunts with cool LEGO prizes and hands-on LEGO building activities for kids. Meet LEGO Santa and LEGO Toy Soldier during daily park appearances. A multi-day party invites kids to move and groove at a high-energy dance party, set fun goals for the year ahead and go on a special scavenger hunt in MINILAND USA before ending the night with an amazing fireworks show over Lake Eloise. Then on Monday, Dec. 31 only, ring in the new year with the traditional before-midnight “brick drop” and an even bigger fireworks spectacular. So mark your calendars, it’s set to be an exciting year at LEGOLAND Florida Resort! All of the events (excluding Brick Dash) are included with general park admission which you can get for just £29.00!! There are many things to look forward to in the coming year at the parks in Orlando, one park in particular which is sometimes overlooked has a preeeeeetty cool new coaster coming in Spring 2018. The experience is the first VR roller coaster designed for kids and will feature a line up from the popular LEGO minifigure mystery assortments and will pit riders in a ‘rollicking race’ against wild, brick built contraptions driven by Trendsetter, Pharaoh, Surfer Girl, Wizard and Pirate Captain. Guests will steer LEGO-built vehicles like a rocket-powered windsurfing rig, a stylish scooter fuelled by espresso and an ornately canopied bed (called a “litter”) carried by mummy servants. Guests will wear (optional) VR headsets to be able to fully immerse themselves in a world built entirely from LEGO bricks that has been inspired by the way kids play with LEGO toys at home. The adventure begins as guests approach the ride’s bold new entry portal as the sounds of roaring engines fill the air. Nearby, the coaster’s queue will resemble a pre-race space where pit crews for each of the five LEGO racers are preparing for the competition, plus interactive, hands-on elements to entertain waiting riders. What do you think of a VR coaster combined with LEGO characters? LEGOLAND are the third park to feature a VR coaster (after Fun Spot and SeaWorld) so could it be a way forward for coasters? LEGOLAND Florida has been busy adding new attractions for the last few years and is slowly becoming bigger and bigger. I have been practising my ninja moves, have you? I hope so as today is the day that LEGOLAND have officially opened their all new Ninjago World. I’m guessing this is going to be a big hit. Ninjago World will hold various childrens games including Ninjago the Ride 4D, Zane’s Temple Build, Kai’s Spinners, Cole’s Rock Climb and Jay’s Lightning Drill. Ninjago the Ride 4D is an interactive ride allowing riders to become ninjas themselves. The screens in front of you will interact with your body movements making it feel like you’re right there in the middle of the action being a ninja! Every kid’s dream right?! Most interactive rides with have devices that you’ll use but Ninjago the Ride 4D just lets you use your hands! Don’t miss out, you can purchase your LEGOLAND tickets from Orlando Attraction Tickets within some of our fantastic bundles, or simply on their own.